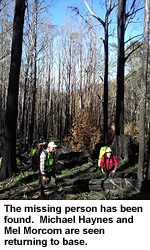 12 July 2010 11:50am A woman who was reported missing overnight near Lake Mountain has been found safe and well. She had spent the night lost after visiting Alps Lookout alone at around 3pm the previous day. On her return to the car park the track became difficult to follow and she eventually veered off the proper track.